Yesterday was a wonderful day of swimming, eating and celebrating! Now it's back to work. I am pretty excited because my husband has offered to watch Ruby this summer while he is off work for six weeks, so I will be working full days starting today. I will still have Ruby on Wednesdays, which is nice because I think I will really miss seeing her. Today I woke up to an alarm and went to work like a regular person! I am sure the novelty will wear off in a few days or weeks, but right now it is exciting and new. Expect to see more items coming to the online shop, lots of blog posts and hopefully I'll get the shop here in Long Beach open by next week. I am planning to share some photos of our backyard project soon, but since I can't walk on the grass yet, it has been a bit difficult to get good shots of the whole yard. In the meantime, I wanted to share some little arrangements I made from a few cuttings I took from the new plants. You don't need a lot of flowers or fancy vases to make an arrangements. 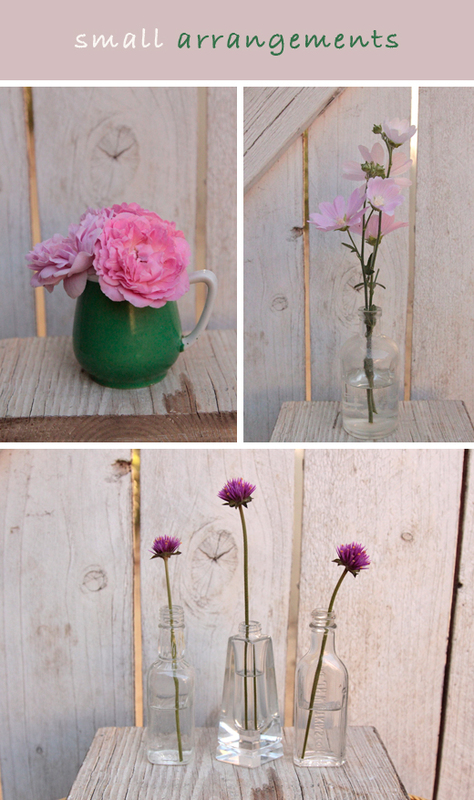 Even a single flower in an old bottle or jar can brighten up a table or counter top! The simplicity of three vases with a single flower is so pleasing.